Why Become A NauticEd School? schools, and yacht charter companies. 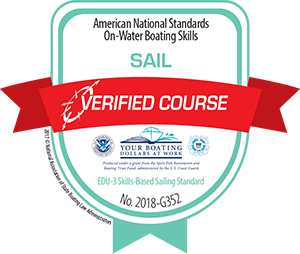 NauticEd is recognised by the USCG as the only sailing education body adhering to the American National Standards for sailing EDU-3. See also the verification letter. This gives comfort and credibility to your students that they are taking a properly recognized course as opposed to your competitors. When a new potential student calls your school, they are more likely to sign up with your school after learning about your 21st century offerings. No student has ever left us and gone back to the "old" way of learning. Our unique prospecting tool brings you more qualified leads. Students have been proven to spend more money through the NauticEd system because of the increased offerings. Never inventory or mail a book ever again or ask a student to come by to pick one up; students can immediately access their course material online. Administative tasks aretaken care of in the background. Your only tasks are to teach practical competence and click a few buttons. NauticEd staff are always here to help (usually with in a few hours). We source students for you and also apply unique technology to turn your web browser tire kickers into real money paying students for you. Less administrative costs; more students; students spend more. Increased profits. No need to play the price war game with your neighbor anymore. NauticEd adheres to recognized National and International Standards and is able to award students with these. The NauticEd SLC international sailing license is based on government issued boating licenses and internationally accepted sailing assessment standards. It is not a made up proficiency certificate that anyone with 4 hours of helm time, $35, and no navigation skills training can attain. Don't just take our word for it, see the sailing school testimonials below and free free to call the principals of those sailing schools. Students these days are on the go. Having the theory information digitally available at their finger tips is not only key but it is impressive. Our optional paper-books are loaded with QR codes which bring the book alive with videos and animations. Modern graphics and videos engage the student. How often have your students shown up having not completed the book work? It is for good reason. Information must be engaging to capture the attention. Students seek 21st century experiences in every thing they do. Why should sailing training be anything less. Over 1 million lines of software code runs the back end to create a seamless user experience. Yacht Charter Companies worldwide know and respect the NauticEd certifications. Not a single Bareboat Charter Master qualified student has ever been turned down. Additionally, the NauticEd SLC™ is accepted by European countries as a valid license. The SLC is easy for students to get, but they must know their stuff. The student's sailing resume is comprised of eduction coursework and testing, electronic logbook, instructor competence sign-offs, badges, real-time GPS tracks, all accessible 24/7 and updates in real time. No waiting for shiny stickers in the snail mail six weeks later. A true certification should be made up of theory knowledge, properly structured competence assessment, and plenty of on-the-water practical experience. It should not be a certificate of attendance. Don't take our word for it. Create a student account now and see the two free sailing courses we give each student. Instructors follow the new American National Standards where by rubrics based assessments provide an objective view to the student's competence. Instructors then sign off the student according to their competence, not the course they take. Instructors can see the student's coursework results prior to the student comes for practical training. The instructor is then able to encourage the student to complete the theory so that more practical learning takes place on the boat. Instructors spend there time teaching on-the-water skills not proctoring tests. Students do their test online, at home, in their own time. Engaging interactive multimedia courses mean the students show up having completed the theory course and passed the tests before they get on the boat. NauticEd's practical endorsements provide more practical classes for students and more opportunities to increase profits. Don't just take our word for it, see the testimonials below and free free to call them for an unbiased opinion. Name a viable company that will survive by being slow to embrace the latest technology in their field. The NauticEd International Sailing Education company is built on the foundation of 21st century eLearning while uniquely and seamlessly incorporating theory knowledge and testing with practical training, assessment and experience. We're not built on promises of what is to come; we are here now with tens and tens of thousands of happy students in 90 countries. Built on a mysql database with over 1 million lines of php code backing up the program, NauticEd will serve your student's and their children for the years to come. This means pertinent information is available to everyone across, up, and down the database at the click of a button. Charter companies can see students resume/coursework/experience/logbook, instructors can their students education progress and manage their students assessments, schools can see students and how their instructors are working with students, students can see their digital sign offs by instructors. Coursework, testing, logbook, and management is all mobile friendly. So whether anyone is on the go, at their desk, in the doctors office, or on an airplane. NauticEd is accessible. Don't take our word for it, just sign-in or sign-up and experience true 21st century sailing education and competency based certifications. "CUSTOMERS ARE NO LONGER STUCK ON AN INCUMBENT BRAND. THE 21ST- CENTURY CUSTOMER IS LOOKING FOR A 21ST- CENTURY EXPERIENCE IN EVERYTHING THEY DO. AT THEIR FINGERTIPS, 24/7, AND NO MATTER WHERE THEY ARE, THEY WANT ACCESS TO INFORMATION ABOUT WHAT IS GOING TO BE THEIR BEST EXPERIENCE WHEN SELECTING A PRODUCT OR SERVICE." P.S. Oh, the fine print. We forgot to mention the cost. Does Toyota charge their dealerships to sell their cars? No, and neither do we. We beleive training students should be a partnership between the Sailing School and us. NauticEd’s systematic approach to building competent sailors is simply brilliant! NauticEd provides the opportunity for us to elevate the programs we offer to our students. Specifically, the combination of (1) sound, comprehensive, academic sailing knowledge education, (2) verified practical sailing skills competency based on national and international standards, and (3) a cloud-based central solution to track and log a student's academic and practical sailing experience, makes NauticEd clearly the superior choice for students, instructors, and sailing schools. Pure and simple, for us, NauticEd ROCKS! Todd Bracken - Dauntless Sailing - feel free to contact us to validate this statement. Island Sailing joined to NauticEd after 20 years as an ASA school, and we are very pleased with the results. Our goal was to develop the best sailing program we could conceive for our students, and that includes consideration that National sailing “brands” have lost relevancy with today’s standards and charter companies. We joined NauticEd because they proved themselves to be a potent partner in developing the resources, support and innovation needed to train and prepare students in a rapidly evolving and competitive sailing and charter market. Simply, training aligned with modern resources, support and methodology is what students want and need. As far as the switch over was concerned, although initially hesitant, Grant and his team made it very simple. We did not lose one student, to the contrary our business has grown from that very day. De Henderson - Island Sailing - feel free to contact us to validate this statement. Landfall Sailing focuses on developing close relationships with our students using a highly professional approach. Having NauticEd as our training partner further demonstrates our commitment to professionalism right from the first contact with the student. In a matter of seconds I have the ability as an instructor to deliver high quality interactive sailing courses to my new student's computer or mobile device. NauticEd's modular approach allows us to tailor the degree of learning our students goals and objectives. By neatly dovetailing theory, education and logbook experience with our practical training, our students love watching their resume grow in real-time; this feature is unique to NauticEd. Landfall Sailing benefits from the fact that by the time we actually see the student, they have completed their theory coursework and testing. Given this, we can now focus on providing a fully professional practical training experience. At the end of our practical training and assessment, we just click a button to sign off on the student's competence. Our boats are immaculate and we expect the same for every aspect of the student's experience with us. With this, we get a lot of repeat upgrade business and word of mouth viral marketing. Bruce Schwaegel - Landfall Sailing - feel free to contact us to validate this statement. We joined NauticEd in 2012 replacing the ASA program at our school. For us, the best parts are the quality self-paced curriculum and the international recognition of the NauticEd Student Sailing Resume for international bareboat Charter companies like Sunsail, Moorings, Dream Yacht Charters, Spartivento and BVI Yacht Charters. Our Club has also benefitted from the streamlining of administrative processes including registration for courses, elimination of pre-course study package mailing & delivery follow-up, and the Instructor's smartphone student certification system. In the 21st century our Club doesn't want to mail and inventory books, grade tests and store records manually. Our Instructors love how we can confirm our students have completed the ashore theory and sailing knowledge before they show up for on-the-water practical sessions. The practical instruction time for boat handling and practicing Rules of the Road has increased by more than an hour. Our selling process has also been streamlined by entering a potential students email address and then just clicking a button to add two free courses to their online curriculum. We follow up and they join quickly after that. Not only has our closing rate gone up but the students keep coming back for more. I highly recommend joining the NauticEd network. Carl Richardson - Vancouver Sailing School - feel free to contact us to validate this statement. Spartivento Yacht Charters - feel free to contact us to validate this statement. We just completed our first full season with our students using NauticEd. They came with an excellent grasp of the theory which helped each group gel together. I can't begin to say how excited I am to be now implementing the new American National Standards. This gives me the right amount of objective data to award the proper level of practical competence and show the students exactly where they need improvement. I feel like I am properly empowered to be their teacher and mentor. I can now award true certificates of competence. The system also allows goal flexibility between students and that is invaluable. Thank-you for what you have done for this industry. Stephen Frankland- feel free to contact me to validate this statement. We've just started with NauticEd and I must say the start up process was simple - almost plug and play. Within days we were fully functional. NauticEd has literally thought of everything that a school could wish for in terms of systems. And this made all the difference to give us an instant highly professional look and resources with zero investment. It is truly amazing what the NauticEd team have put together. Chris Block - feel free to contact me to validate this statement.